Lauda-Königshofen is the name given to two nearby towns (unsurprisingly, Lauda and Königshofen) located next to one another towards the western end of the Tauber valley. 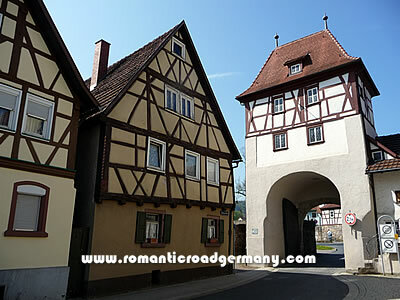 Tauberbischofsheim and the motorway north to Würzburg are to the west while Rothenburg is at the other end of the valley and the pleasant small villages and towns of Creglingen and Bad Mergentheim are along the way south. The two towns are known for their vineyards on the hills on either side of the Taubertal and for the wines produced in the area. Lauda is the largest of the settlements which make up the local government area of Lauda-Königshofen and is the town with the most historic importance. The name Lauda is thought to have come from the Celtic but the first written mentions of a settlement date from the early Middle Ages and the Counts of Luden. As was common in these centuries, Lauda changed hands amongst the various Prince-Bishops and counts numerous times. It was an important trading point for wine and related goods and in the 14th century was given the charter for township and in the next century the economically important right to hold a market. 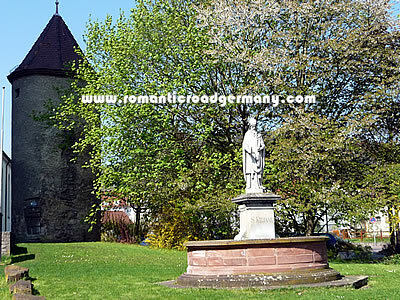 The Upper Tower, pictured above, dates from this time, while the Pulverturm ("Powder Tower" or magazine) pictured at the top of the page from a century earlier. The confusion about control of Lauda and neighbouring villages continued into recent centuries, and although the more modern state of Baden-Württemberg brought clarity into administrative matters on a regional scale, it was only in the 1970s that Königsheim was added to Lauda to create the administrative area that today exists. As well as the vineyards, Lauda has traditionally been an important rail town and connection, at the junction of three main lines.